Watch this carving as it was made!! Featured in the 2009 Summer Edition of Woodcarving Illustrated. Watch this carving as it was made. A tutorial for this tree and its pattern are featured in the Fall 2010 edition of Woodcarving Illustrated. 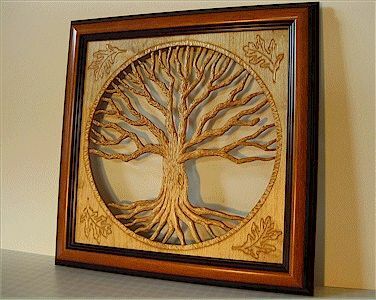 To celebrate Heartwood Art carvings being featured in Woodcarving Illustrated and Scroll Saw magazines, this Gaia carving was created at the request of my dear friend who kindly took the pictures that will appear in the magazines. 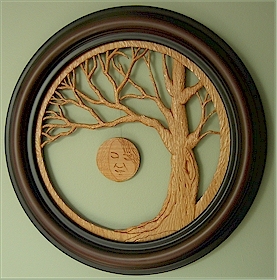 She stands over a foot tall and has a hand-rubbed oil finish that offers a soft sheen to the wood. The base is made from the same stock as the body and includes a special oil-based pigment to give it a deep contrasting color to the figure. You can watch this carving as it was being made in the step-by-step Follow My Carving series.